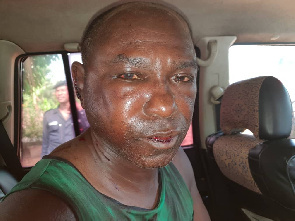 Bani Kafui Liberty, 56, is seeking justice in court after he was nearly lynched by some youth of Tsakpokope in the South Dayi District of the Volta Region over allegations that he had a hand in the death of one Atsu Davor who was found lifeless behind his ‘Liberty Hills Hotel’ in Kpeve. According to Mr. Bani, a group of youth from Tsookpokope had set out in search for the late Atsu Davor when he heard of them in an ecopark he has been working on. He said upon interrogation, he found out the youth were looking for one of their natives whom he presumed would have been the body he discovered. He said he directed them to the police only for them to return with a mob to attack him and burn down his hotel and threaten to kill him. “All 16 rooms of the Liberty Hills Hotel and it’s beautiful ornamentals were destroyed by the mob,” Mr. Bani lamented. Mr. Bani was dragged by the mob for nearly 3 kilometres amidst beatings and insults in the presence of the police until a benevolent man who he could barely remember came to his rescue. The DCE for South Dayi District, Mr. Earnest Patrick Mallet confirmed the occurrence to Citi News saying he had a distress call that fateful day and had to intervene to save the life of the 56-year-old Bani who bearly had any energy to defend himself and sent him to the Hospital. Autopsy reports signed by C/Supt/Dr. O. Owusu Afriyie sighted by Citi News indicates that the late Atsu Davor died of “severe fatty liver Disease and Hypertensive heart disease”. The statement also described the 41-year old’s death as a “Natural death”. The Tsokpokope community has been at loggerheads with Mr. Bani over his frequent arrest of their animals. Mr. Bani told Citi News he has on several occasions arrested animals that come destroying his ornaments. A brother of the deceased who prefers to remain anonymous told Citi News that “Mr. Bani had no issues with the diseased except to say the only challenge the community had with Mr. Bani was his incessant arrest of their animals”. “I am trying to build an eco-park and some of those plants are expensive. some of them are Ghc. 500 and more so I warned the community folk not to let their animals into my yard otherwise I will arrest them and hand them over to the town council. In fact, I have arrested such animals time and again and handed them over to the town council,” Mr. Bani told Citi News. Mr. Bani has since reported the case to the Ghana Police Service and his hopeful that the perpetrators to book. The staff officer at The Volta Regional Police command, ASP Felix Danku, confirmed the police has on April 3, arrested and prosecuted 7 persons who were allegedly involved in the mob that attacked Mr. Liberty Kafui Bani. The 7 and three others who were arrested last Friday [ April 12, 2019] dawn remain in protective custody as the 7 have failed to meet the bail requirement. The 3 have not been able to go to court as the Judge of the circuit court, her Worship Priscilla Dikro was out of town on Official duty.